Water bottles. Fabric for curtains. Microwave oven packages. Three seemingly different materials, yet each containing a common feature: the raw material para-xylene. Para-xylene is just one of three isomers of xylene. Isomers have the same type and number of atoms, but each isomer has a different chemical structure. The other xylene isomers include ortho- and meta-xylene. These isomers have varying applications, and out of the three, para-xylene is the most industrially sought after due to its use in a variety of products. One route to obtain para-xylene is by purifying commercial-grade xylene, which typically consists of 40 to 65 percent meta-xylene and 20 percent each of the ortho- and para-xylene isomers. Chemical industries traditionally separate these isomers through a process called distillation. This involves heating a chemical mixture and separating the components based on their boiling points, but distillation consumes a significant amount of energy, approximately 4.8 quadrillion BTUs, or 40 percent of the processing energy used in chemical plants. As a result, researchers are investigating alternative separation methods. Metal-organic frameworks (MOFs). One potential alternative includes using MOFs to separate molecules of different sizes. MOFs are porous materials composed of metals and organic linkers. Think of a MOF like a fishing net. In a fishing net, smaller fish swim through the net without a problem, while the big fish are left trapped inside. The same concept applies to molecules of different sizes moving through MOFs. However, what happens when all of the molecules are the same size but have different configurations? Can we still use MOFs to separate these molecules? 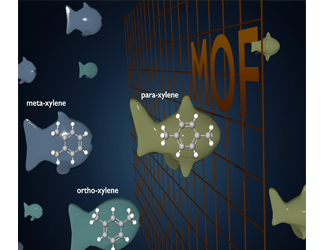 Maybe a MOF is more than just a fishing net. It turns out, ortho-, para-, and meta-xylene are roughly the same size but have different chemical structures and geometries. The question of using MOFs for separation now becomes more interesting. Researchers in the Center for Gas Separations Relevant to Clean Energy Technologies (CGS) Energy Frontier Research Center addressed how these small xylene molecules move when confined in a tightly woven MOF. The team placed ortho-, para-, and meta-xylene inside of MOF-5. The pores, or gaps in the net, are about twice the size of the xylene molecules, meaning all of the molecules should be able to diffuse through the MOF. The team used an experimental technique called nuclear magnetic resonance pulse-field gradient diffusion to study how fast the molecules diffuse and rotate. Using this technique was a significant milestone because experimental studies on molecular motion inside MOFs are not very common, and motion is often measured using computer simulations. That being said, the researchers also performed simulations and found that their experiments and simulations were in agreement. Excellent. We can study the motion of molecules through MOFs using both experiments and simulations, but what does this tell us? Geometry and speed matter. Let us go back to the original question: can we use MOFs to separate molecules that are the same size? The answer is not so clear-cut, but the results look promising. Para-xylene has a cylindrical shape compared to the other xylene molecules, and computer simulations reveal para-xylene has the weakest interactions with the MOF walls. The weak interaction enables para-xylene to move the fastest through the MOFs, but the cylindrical shape prevents the molecule from being able to rotate as well as the other xylene molecules. The researchers compare this rotation to that of a flying Frisbee. Understanding how the molecules rotate and move through the MOF enables future tuning of MOF materials for better separation applications. Further, these research findings suggest that we may be able to isolate para-xylene from the other isomers as a function of time, with para-xylene separating first, since it diffuses fastest. The research efforts by the CGS team provide an interesting outlook on the use of MOFs to not only separate molecules that are the same size but to do so in a way that requires less energy compared to traditional distillation processes. There is still much work to do in this area, but in the meantime, researchers will continue to study these cool materials. This work was supported as part of the Center for Gas Separations Relevant to Clean Energy Technologies, as an Energy Frontier Research Center funded by the Department of Energy (DOE), Office of Science, Basic Energy Sciences (experimental and characterization studies); by the National Science Foundation (stipend V.W., S.J. ); by ENERSENSE (S.K.S. ); and by Deutsche Forschungsgemeinschaft (S.M.M.). This research used resources of the National Energy Research Scientific Computing Center, a DOE Office of Science user facility. S.K.S. acknowledges Sigma2 for computational resources. Water bottles. X-ray films. Curtains. The connection? These materials all require the chemical para-xylene. But obtaining the chemical typically requires separating it from two similarly sized chemicals. That separation is typically done using heat. Scientists wanted a more energy-efficient option. They turned to net-like molecules called MOFs, or metal-organic frameworks. At the Center for Gas Separations Relevant to Clean Energy Technologies (CGS), researchers wanted to see if MOFs could separate similar chemicals based on how the molecules rotated. They can. 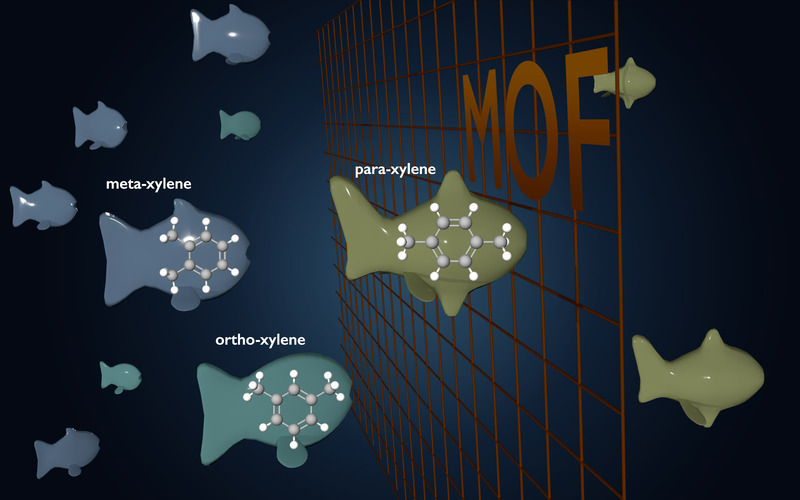 Para-xylene’s weak interactions with the MOF walls enable it to move the fastest through the MOF. There’s still much work to be done, but it opens up some interesting options. The CGS is an Energy Frontier Research Center led by the University of California, Berkeley.